Boats embarking on an offshore passage should be fully found, thoroughly seaworthy and manned by an experienced crew who are physically fit to face any weather. Storms at sea carrying winds of 30 knots or more with accompanying waves of 8 to 10 feet are not uncommon. 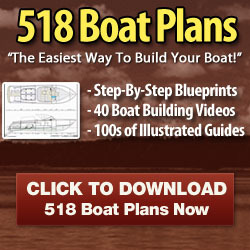 It is important that your boat is capable of making headway in rough weather sea conditions. Keeping cool by staying out of the intense midday tropical sun is essential for maintaining your physical comfort. Shaded decks with large awnings and biminis will drop the temperature below decks by five to ten degrees. Dinghies represent your sole means of inter-harbor transportation while cruising in the waters of Belize and Mexico. As there are very few docks to lie alongside, your dinghy will be in constant use and will really be put to the test. You will need to rely upon it in all kinds of weather. It should be of stout construction and stable in moderately rough seas. The typical 7-foot yacht tender will be inadequate for the regular use you will demand of it. My advice is to carry the biggest dinghy that you can possibly bring on deck, or deflate and stow below. Never go out in your dink without an anchor and oars. Carry extra gas, shear pin, pliers, screwdriver, flashlight, and pump for inflatables. Diving expeditions require stable dinghies and reliable outboards. capable of at least 1- to 2-mile passages in possibly choppy conditions while loaded down with two or three passengers, dive equipment and anchor. To this extent, rubber inflatables have many advantages over hard dinghies. Rubber inflatables are excellent for diving as they are very easy to climb into, have terrific load carrying capacity, are extremely stable and seldom capsize. The disadvantages of rubber dinks are that they are almost impossible to row for any distance and must be deflated and stowed for any long passages. Sharp objects such as spear tips, coral, conchs or fish barbs can accidently turn inflatables into deflatables. Be sure to carry a supply of patch material and glue for emergency repairs. Better results can be obtained by using marine adhesive 5200 in place of glue but you must allow at least three to four days drying time. Rubber inflatables tow better than you might expect in all but really heavy weather. Confused seas and strong gusts frequently will flip inflatables upside down. For this reason always bring your outboard engine on board before towing your dink any distance. Towing eyes are internally weak on all rubber dinghies. For safe measure when towing inflatables use two separate lines attached to at least two separate points on the dinghy. Stainless steel pad eyes bolted on the transom work well. Be extra cautious that your dink is well secured to your boat. A good habit to get into is securing the dinghy to your boat with a plastic coated cable and padlock. The holding ground in Belize and Mexico is either soft mud, sand, grass, or ledge rock, as in the case just offshore of San Miguel, Cozumel. It is important to carry at least two different anchors each with ample rode and a minimum of 15 feet of chain per anchor. On board our 33-foot sloop, we carry a 35 pound CQR Plow, a 22 pound Hi-Tensile Danforth, and a spare plow just in case one is lost. In general, winds will be from the east to southeast except when northers blow during the winter months. For increased holding power, you may want to put out two anchors. For best results, lay one anchor out ahead into the direction of the wind and drop the other anchor off at an angle 90° perpendicular towards the direction of probable wind shift. In strong winds allow a scope ratio of 7 to 1. When anchoring in a crowded harbor where there is limited swinging room or where strong tidal currents reverse, it is wise to set two anchors 180° apart. This is commonly referred to as a Bahamian Moor and is diagrammed below. 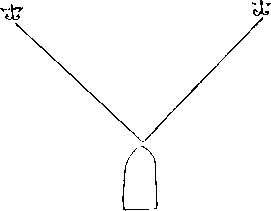 Two anchors are set 180° apart with both rodes secured to the bow. The bow pivots over the same spot and swinging is limited to the length of the boat. If the harbor is too crowded to safely set the second anchor under power, carry it in your dinghy out to where you want it. Make sure the aft or downwind rode is slack enough to stay free of the keel. Don't try to set the rodes too tight.